Fully modulating, natural gas tankless water heater with sealed combustion and power vented flue. Supplies hot water to domestic hot water systems (directly or indirectly) and can be used with water storage tanks, recirculation systems, and/or combined domestic and heating applications. 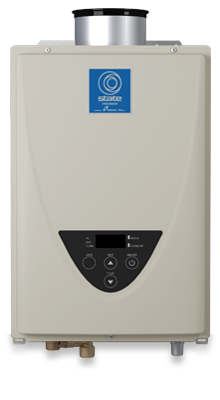 The GTS-310C-NI tankless water heater uses up to 190,000 BTUs of Natural Gas or Liquid Propane to deliver a max flow rate of 8.0 GPM. It utilizes condensing technology to achieve a Uniform Energy Factor of 0.82. This model meets Ultra-Low NOx requirements, and has a 15-year limited warranty on the heat exchanger in residential applications. Easily convertible from natural gas to propane with supplied kit..
Built-in Freeze Protection, Manual Reset Hi Limit, Overheat Cutoff Fuse, Inlet and Outlet Thermistors for Constant Temperature Monitoring. Direct vent APNC35 concentric vent system, Vertical or horizontal vent termination installation, Power direct vent.